Shake with ice, strain into a cocktail glass, and garnish with an orange twist. Note: the recipe I found stated stirring, but both photos of the drink that I spotted online were frothy as if shaken. 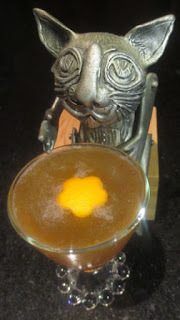 Two Saturdays ago, I made another drink that I had spied on BarNotes called the Devil's Mustache. This mezcal-Cynar Sour was created at Haddington's in Austin, Texas, circa 2011, and it was attributed to Florian Minier there and to Austin bartender Wesley Borden in Tasting Panel magazine (albeit with no bitters, and with agave syrup and lemon instead of simple syrup and lime). Evidence supporting the BarNotes' story was that the information was provided by another bartender at Haddington's with the comment that it was "created by Florian Minier... who word has it had a phenomenal mustache." Made that way, the Devil's Mustache offered up an orange, funky herbal, and smoke bouquet to the nose. Next, lime mingled with caramel on the sip, and the swallow showcased smoky agave melding into Cynar's herbal flavors and finished with mineral and citrus notes. Overall, the cocktail joined the collection here of other smoke-forward Devil's drinks such as the Devil's Soul and the Devil's Backbone.